Blood taken from Adeline, patient of the research hall. Restores HP, and continues to rejuvenate HP for some time. The Blood of Adeline will instantly restore 50% of your total HP upon use, and your HP will continue to regenerate gradually for 10 seconds after that. Like other specialty blood items, you can only hold one of these at a time, and further requests will be denied until you have used the one you're holding. Furthermore she won't give you one if you have the Blood of Arianna or Blood of Adella in your inventory; you have to choose which you want to use. Testing: Gradual healing starts after initial animation ends, then continues for 10 seconds. Vial heals 5 HP every 3 frames, making it 50 HP healed every second. Blood of Adeline will, after initial 50% heal, gradually recover 500 HP in total. 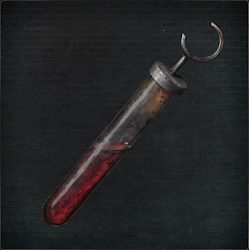 Acquired from: Adeline, Research Hall Patient, to acquire this blood you'll need to go to the Research Hall and give some Brain Fluid to Adeline in the Floor 1 Laboratory. 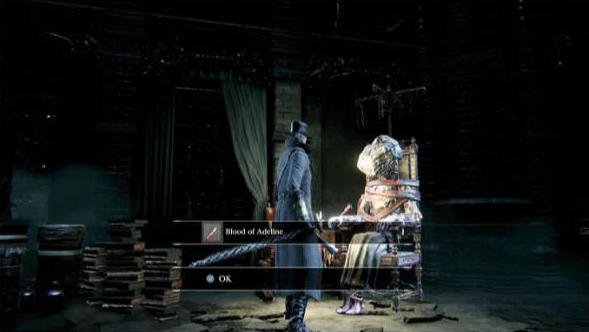 After giving the third Brain Fluid to Adeline you will be unable to receive any more of her blood, so if you're going for the Milkweed Rune, make sure to get a vial of her blood first or you'll have to wait until NG+. You can only have either Blood of Adeline, Blood of Arianna or Blood of Adella in your inventory at the same time.